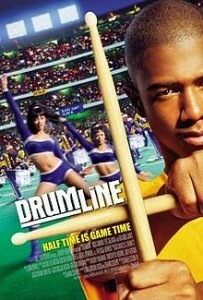 A fun, clever movie about an arrogant kid with natural drum talent trying to navigate his way through a college program. Drumline is better than i would have ever expected. it’s far from anything amazing or revolutionary or even out of the box at all, but it still takes what could have been a cliched movie and finds ways to make it work. it’s about a kid named devon miles, played by nick cannon, who goes off to college to join a top band program where he will studying the drums under the talented dr. lee (orlando jones.) Devon thinks he’s all that, and he’s arrogant as hell, but the problem is…It’s kind of true. Devon’s narcissism makes him clash with an older captain of the band, named sean. there are rules that these freshman have to follow, such as waking up on time and wearing white t shirts, and devon does things his own way. he’s under the impression that the band needs him more than he needs them. this makes sean pretty furious. then there’s dr. lee who recognizes devon’s talent enough to not get frustrated with the boy, but doesn’t know how to bring his ego back down to earth. especially when devon is the highlight of every show the band does. there’s a great moment at one their early performances where sean tells devon that if he thinks he’s so great, why doesn’t he just take over sean’s solo. it’s a challenge that sean knows devon will never do. no freshman would ever have the balls. only…devon kinda does. that moment, where the two of them end up playing side by side, before devon kneels down in front of sean and they continue to play at the same time, is the highlight of the show. afterwards, it’s all anyone is talking about and it makes devon into a superstar. but for dr. lee, this is the last thing he wants to hear. it was not something that dr. lee had told them to do, or a part of the plan, and he is furious about the whole thing. an ongoing plot line in this film is dr. lee dealing with the board and specifically the dean of the school. the dean wants popularity. he wants to band to generate revenue from the alumni and excitement from the fans. this dean preaches an out with the old in with the new kind of attitude, but dr. lee doesn’t want to hear it. he looks at the new, music like “the thong song,” and can’t imagine disrespecting music greats of the past by having his band play that instead. it’s a matter of taking his profession seriously and not selling out just for the money and the popularity. meanwhile, devon has started to date a girl who is a captain of the dancing team (Zoey saldana in one of her earliest roles.) Saldana is excited about this new guy in her life and doesn’t realize that his arrogance is a problem. she chooses to see it just as confidence instead, and that leads her to invite her parents to the homecoming game, where they can meet her new boyfriend. the homecoming game is a disaster. it’s one of the scenes that really punctuates just how far devon is falling. when he bangs on an opponents drum and ends up starting a huge fist fight, you can bet he’s reached a point where he now embarrassing his team. saldana, of course, does not want her parents to meet him after that, and who can blame her. later on, she has a moment where she explains to him the way her parent’s reacted to the fight, and the young man who started it, and you can totally see why she snubbed him after the game. things get even more heated then this. devon is actually kicked off the team and recruited by another school. i love that the movie isn’t afraid to go as far as that. this isn’t just risk suspension, or be suspended, this is go over to the competition and get a taste of that. it’s a gutsy move, and it helps us see just how far this kid has fallen. he’s gone from the star of the band to not even being on it at all. of course all the cliches you might expect to happen do end up happening. luckily they are all saved for the final act, and so for three quarters of the movie we actually get an interesting film. i don’t like the way his problems with sean are resolved, so neatly, so unrealistically. and the final band competition isn’t half as impressive as it should have been. but what does work is the way dr. lee has to find a balance between the old and new and kind of learn a lesson himself. this movie certainly slacked off in it’s final act, but for most of the way through it was pretty entertaining. it was smart enough to have two different story lines going at once, the primary plot about devon as the new hotshot on the team and then a secondary plot about dr. lee having to find a way to welcome in the new without sacrificing his own beliefs about the old. when one storyline wasn’t working, the other one was, and that helped keep the film afloat at all times. it wasn’t a great movie, because none of the ideas were extraordinary or anything, but it was still a lot of fun. in many ways this movie reminded me of the cheerleading competition film bring it on, which is also fun, but for very different reasons. that movie was about humor more than anything else. this one is about plot. it has a well structured plot, with many unexpected moments, and for the most part it delivers.